Welcome to the Week 13 Tight End Rankings! This is maybe the roughest position out there with so many ugly situations and injuries. Gronk is back to some degree, which helps, and we get Kelce back from his bye week, so at least we have some strength at the top. If you are in a real pickle, Matt LaCosse of Denver could be a help. He’ll take over a good-sized role left behind by Jeff Heuerman. The Jets Chris Herndon is a better option but less likely to be available. Jonnu Smith is another but I’m concerned that he’s one of the few things the Jets may shut down this week versus Tennessee. I like Jonnu a lot for the rest of the season. These rankings will be updated on Saturday. All Rotobahn rankings are based on .5 PPR scoring. 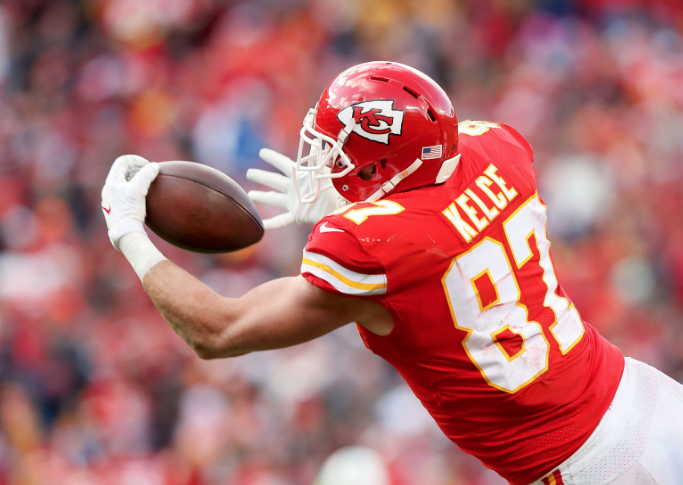 1 Travis Kelce KC 7.000 KC@OAK 12/02/2018 04:05PM ET Great matchup. 2 Zach Ertz PHI 6.600 WAS@PHI 12/03/2018 08:15PM ET Locked into a major role. 3 George Kittle SF 5.900 SF@SEA 12/02/2018 04:25PM ET He’s the number one option for them right now. 4 Eric Ebron IND 4.200 IND@JAX 12/02/2018 01:00PM ET He trashed these clowns for three scores in their last meeting. Have to think they’ll pay attention to him this time around. Maybe just one score. 5 Rob Gronkowski NE 5.400 MIN@NE 12/02/2018 04:25PM ET Looked better last week. Very startable here. 6 Greg Olsen CAR 4.100 CAR@TB 12/02/2018 01:00PM ET Has become TD-dependent in recent weeks, but he has four in the last six games. Good matchup here. 7 David Njoku CLE 4.300 CLE@HOU 12/02/2018 01:00PM ET Solid matchup. 8 Jordan Reed WAS 5.300 WAS@PHI 12/03/2018 08:15PM ET Questionable with a sore back but expected to go. 9 Cameron Brate TB 3.700 CAR@TB 12/02/2018 01:00PM ET Should continue to be startable. 10 Jared Cook OAK 4.700 KC@OAK 12/02/2018 04:05PM ET He’s doing less than earlier in the year but has been bailed out by TDs the last two games. 11 Austin Hooper ATL 3.900 BAL@ATL 12/02/2018 01:00PM ET Better matchup this week. 12 Trey Burton CHI 3.800 CHI@NYG 12/02/2018 01:00PM ET Should bounce back this week. 13 Jimmy Graham GB 4.000 ARI@GB 12/02/2018 01:00PM ET Playing with a bad hand so he has some limitations. 15 Kyle Rudolph MIN 3.600 MIN@NE 12/02/2018 04:25PM ET He’s in play this week with Diggs banged up. 18 Jonnu Smith TEN 3.300 NYJ@TEN 12/02/2018 04:05PM ET Has some upside but the Jets have strong safeties. 33 Hayden Hurst BAL 2.500 BAL@ATL 12/02/2018 01:00PM ET Had three grabs last week but not playing enough snaps to trust yet. 56 Evan Engram NYG 3.800 CHI@NYG 12/02/2018 01:00PM ET Probably out with a hamstring.